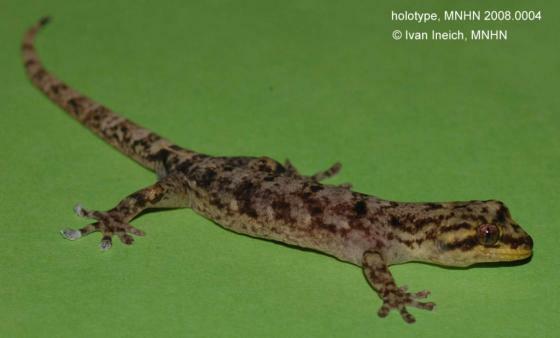 Can you confirm these amateur observations of Lepidodactylus buleli? Distribution Vanuatu, Espiritu Santo Island, 630 m elevation. Types Holotype: MNHN-RA 2008.0004, an adult male, collected as an egg on 14 November 2006 by Ivan Ineich. It was euthanized with sodium pentobarbitol injection in March 2008 after numerous photographs were taken. A sample of tissue was preserved from the ventral side of its right thigh. Paratypes.- None. Diagnosis Diagnosis. An intermediated-sized Lepidodactylus, body slightly depressed dorso-ventrally, limbs overlapping when adpressed. Two or three deep notched or divided subterminal scansors of second through fifth digits of the fore- and hindfeet (thus belonging to Group II of Brown and Parker 1977). It differs from other Group II members by the following combination of characters: moderately dilated digital pads of pes and manus, lamellae covering most of elongate toe length, presence of one enlarged cloacal spur followed by 2–3 smaller spurs on each side (fig. 5 in INEICH 2008), a short and wide snout (fig. 1), an elevated number of midbody scale rows, uniform lemon-yellow upper- and lower labials and a yellowish head area mixed with purplish dark brown particularly between eye and in the tympanic region (fig. 4), whitish chin and throat (fig. 3), and a distinctive anchor-like yellowish to cream dorsal pattern at the base of tail (fig. 5). By its scalation, L. buleli is most similar to L. pulcher Boulenger, 1885, from Wild Island off the northwest coast of Manua Island (type locality), and Plot and Lengendrowa Islands on the southeast coast, Admiralty Islands, Papua New Guinea. Records from the Huon Peninsula need confirmation (Bauer & Henle 1994: 162). With that species it shares an elevated number of midbody scale rows and IOS (Table 2). It can however be distinguished from L. pulcher by its lower count of fourth-toe lamellae, its slight toe webbing, the lack of typical heavy spotted head pattern (Boulenger 1885) and presence of dark medio-dorsal black spots even present in preserved specimens (see Plate XIII, fig. 5 of Boulenger 1887a illustrating L. pulcher), shorter and narrower head and its colouration; also by the presence of several cloacal spurs vs. only one in L. pulcher (see Ota et al. 1995). It also differs from L. guppyi by several scalation characters (tabl. 2) and its more flattened and less elongated body shape, colour pattern and interorbital dark band (see pl. 19–20 in McCoy 2006). Comment This species was discovered as an egg who the author kept until the holotype hatched. Etymology The specific epithet buleli is given by the author as a reference to a personal and private story and has no particular signification related to the species, its characteristics, geographical origin or biology. It is a noun in apposition and not formed from the masculine personal name ‘Bulel’ in the genitive singular case.